The State of Madhya Pradesh in India is not just home to the famous Kanha National Park and other wildlife sanctuaries, but has plenty of beautiful tourist spots within driving distance of this National Park. Hence it is advisable to keep aside at least a week to enjoy all the various beautiful sites around this place. 1. Jabalpur Tourist Attractions: If you are traveling by train to visit the National Park, the nearest railway station is at Jabalpur. It is a good idea to spend a day or two in this town before visiting the Park as there are some interesting tourist attractions in Jabalpur. 2. Bamni Dadar (Dadar means plateau) Tourist Spot: This is the most popular tourist attraction near this place due to its breathtaking sunset views. Not surprisingly, it is referred to as Sunset Point. While you watch the sky changing its colours with the sun dipping over the horizon, you may suddenly spot quietly grazing deer species. Keep your cameras and videocams ready! 3. 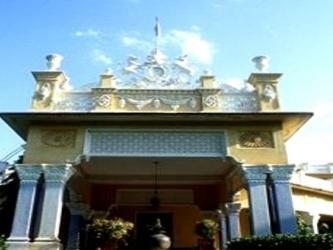 Kawardha Palace Madhya Pradesh: This magnificent palace, built by Maharaja Dharamraj Singh in the 1930s, is located in the midst of beautifully landscaped gardens over an expanse of 11 acres. Designed from massive Italian stone and marble piece, the highlight of the Kawardha Palace is its Durbar Hall with an imposing dome. It is here that the Maharaja held court with his officials and met the residents of his kingdom. The Haathi Darwaza (Elephant Gate) leads you over the threshold to numerous rooms. All the rooms of the palace have high ceilings, adding to the spaciousness of the structure and marble staircases connect the lower levels with the upper ones. You can also visit Mandawa Mahal and the Madan Manjari Mahal, ancient regal homes of the 11th century, located about 20mins. drive Kawardha on its northern side. 4. Temples nearby: After visiting the Kawardha Palace, you can spend some time visiting the nearby temples. One is the Radha Krishna Temple with its unique underground rooms where sages during ancient times spent hours in meditation. There is also a water tank adjacent to the temple. The other group of temples which are famous here are the Bhoremdeo Temples on the banks of the Pushpa Sarovar Lake. Set up by the Nag dynasty ruler King Ramchandra, these temples were built in honour of Lord Shiva and have interesting stone carvings. 5. The Saroda Reservoir Madhya Pradesh: Locate just over 12 kms away, this reservoir is a man-made water source where you can avail of fishing and boating facilities. Due to its fairly quiet location, it makes for a good picnic spot. 6. 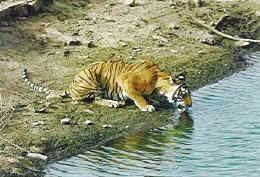 Sahaspur Wildlife Sanctuary Madhya Pradesh: If you have not quenched your thirst for wildlife at the Park, you can also visit the Sahaspur Wildlife Sanctuary. Located about 21 kms from Kawardha, this sanctuary too has plenty of wildlife residents including jungle cats and leopards. Bird species also thrive due to the forest tank, where you can catch glimpses of kingfishers, ducks, herons, egrets, etc. The Forest Department officials of the sanctuary can arrange for a night drive through the sanctuary – a unique experience! Do not book an itinerary for mid-June to October, as the park is closed at that time. Although this is the time when the Park has a lovely green carpet and the deciduous trees don a pretty look, the Park remains closed to visitors during these monsoon months (early November too it could be closed, so check before visiting). Although you can visit between the months of November to February, during these months you may not see too many wildlife residents. There is no lush greenery, but plenty of frosty weather! What's more, the months of December and January are extremely cold and you will have to bundle up against the chilly weather. The best time to visit is during March to mid-June. You may face hot days in late-April and May and may even be faced with an unexpected shower of hail in March-April. Nevertheless, February to mid-June are the best months as it is during the months of March to mid-June that you will see most of the inhabitants basking in the sunshine. This is also the time when romance blooms between the stags. The Park is open to visitors for a greater part of the year, except in the monsoon season. 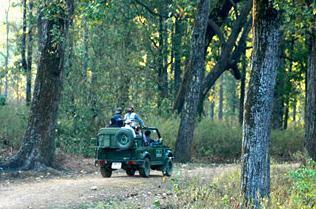 What are the timings of the wildlife safari? The timings for visitors vary depending on the seasons. While the Park is completely closed during the monsoon season, the timings during other seasons depend on the daylight hours. 1. From October 1st to February 15th: Sunrise to 12noon / 1500 hrs. to sunset. 2. From February 16th to April 15th: Sunrise to 12noon / 1600 hrs. to sunset. 3. From April 16th to June 30th: Sunrise to 11a.m. / 1700hrs. to sunset. The entry fees includes the jeep travel and charges for a guide. (i) Charges for hiring a jeep could be more than mentioned above. 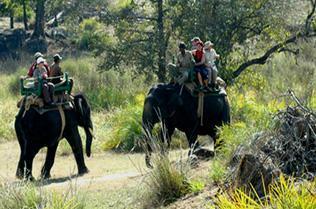 What are the Fees for Elephant Safaris? 1. Fees for Indian citizens: Rs. 100/- per person. 2. Fees for Foreigners: Rs. 600/- per person. 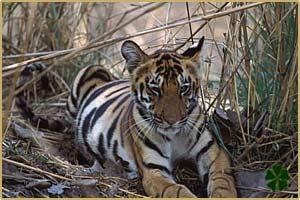 More information: Reaching and accommodation at Kanha National Park, Madhya Pradesh. 1. The Park covers two districts – Mandla and Balaghat. Hence, there are 2 entrances to the park, one at Khatia ( Mandla District) and the other at Mukki ( Balaghat District). Visitors should therefore confirm in advance the timings for excursions to the Park, as it is possible that these entrances are open at different times of the day and also in different seasons. Otherwise you may well end up at a locked gate! 2. Camera fees : While you do not have to pay any fees for using your camera or video cam inside the National Park, you need to pay fees for any kind of commercial photography and also take prior written permission for the same. 3. It is compulsory for every visiting group/individual to have a guide and pay the guide fees. You cannot explore the Park on your own. 4. It is best to explore the Park in the jeep provided rather than take your own vehicle so that you can enjoy the experience better without having to concentrate on driving! Also, there are restrictions on speed limits (not more than 20 km per hour) and diesel and heavy vehicles are not permitted inside. Also, you cannot use the car's headlights or horn or crank up the car's stereo system at full blast. 5. You are not allowed to wander around the Park on foot. At all times, you must remain seated inside your vehicle. Make sure, too, that the kids in your group do not suddenly get out of the vehicle when you stop to take photographs from the car/jeep. 6. You must not carry penknives, darts or any kind of weapons – these will be confiscated. You should definitely carry extra batteries for your camera, as you will not find shops nearby. Also carry a small torch. 7. Wear comfortable clothing with soft colours. Avoid wearing clothes with bright neon-type colours. You should blend in! Also wear comfortable shoes, a hat and sunglasses. It is advisable to carry sunscreen lotion if you have sensitive skin. 8. While you can carry some snacks with you, you are not allowed to feed any of the animals or birds in the Park. No alcohol is allowed inside the Park. 9. Avoid being boisterous, indulging in loud chatter and generally making a noisy nuisance. 10. Please do not litter the Park premises by throwing empty water bottles out of the car window or other kinds of trash. Respect the environment and keep the place clean.